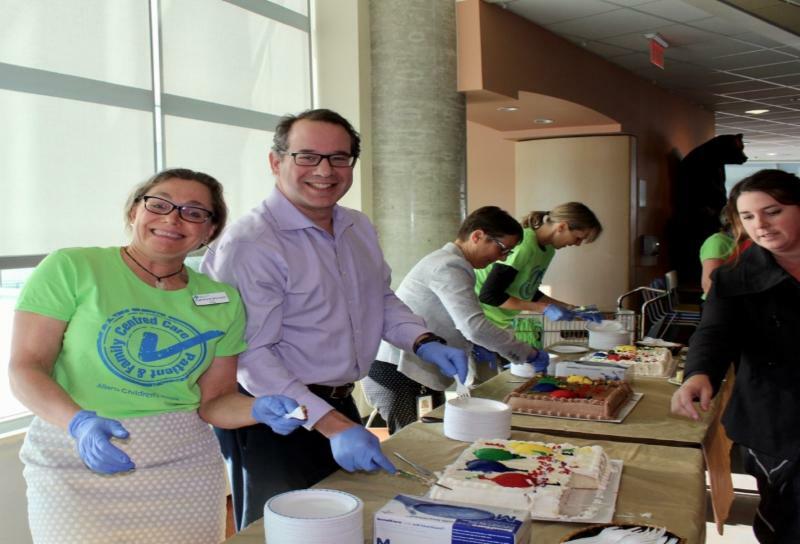 Our 6th Annual Patient and Family Centred Care Week was an energetic celebration of the theme "Navigating Healthcare with Compassion". 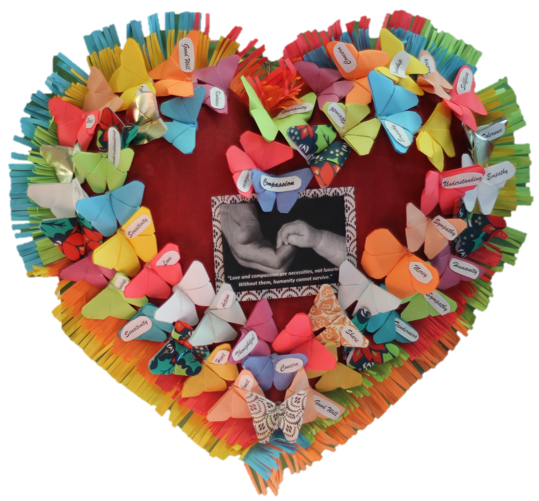 From the kick-off on Monday to the Celebration on Friday, many staff, patients, and families were engaged in reflecting on compassion as they added to our Compassion Tree and viewed the beautiful hearts decorated by ACH teams. 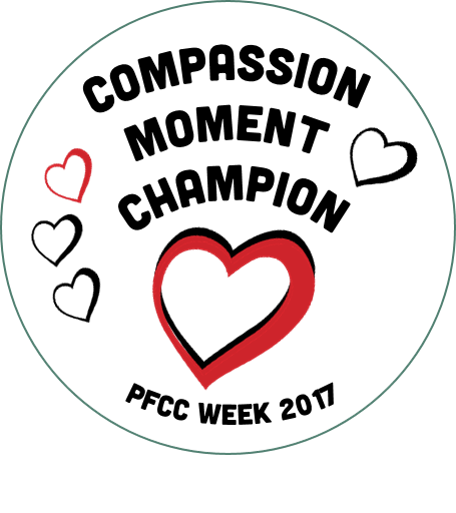 We were reminded that those little moments of compassion make a difference when we saw a staff member wearing a "Compassion Moment Champion" button. Staff were thanked personally for their caring on patient/family/leader walkabouts. Many thanks to the PFCC Week working group for making this week happen and to all of the patients, families, staff, and volunteers who participated. Thank you to all the talented patients, families, staff, and volunteers who "Put a Little Love in our Hearts" with a lunch time flash mob to kick off Patient and Family Centred Care Week. Special thanks to Heath and Pam Kai, parents of ACH, for choreographing and leading this special event! Health Information Management! Congratulations on receiving the team challenge trophy and a coffee party! The flying butterflies represent the benefit of spreading compassion beautifully through people we meet everywhere on a daily basis. We had 42 heart entries! Thanks to everyone who participated. The creativity and thought that went into each heart sparked great conversations about compassion. The hearts are now on display in a display case on the first floor. The Health Information Management team being awarded their trophy by Jill Woodward, Executive Director, Inpatient Care, and Lois Ward, Executive Director, Ambulatory Care AND one of the boards displaying the heart challenge entries. We asked patients and families to nominate staff who demonstrated compassion to them - and the nominations poured in! Over 100 buttons were distributed around the site to acknowledge these Compassion Moment Champions. These individuals represent just a sample of the compassionate people that care for patients and families at ACH. Her kindness stands out as a positive memory in the hardest time of my life. Left - Respiratory Therapist, Jennifer Herbert receives her nomination and button. Right - Hema Tinai, proudly wears her but Compassion Champion button. 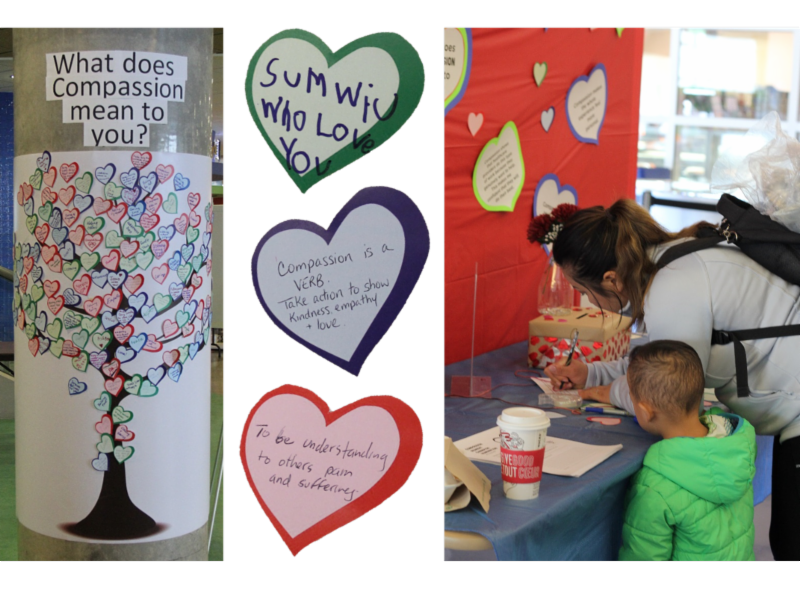 Patients, families, and staff added a heart to our compassion tree expressing what compassion means to them. Throughout the week, a patient and/or family member walked about an area of the hospital with a site leader/manager to thank staff for caring. Almost a 1000 candy packages were given out. Our week closed with a noon hour celebration honouring our compassion moment champions and announcing the winner of the compassion team challenge. Thanks to family member, Christine Johns, and former patient, Aria Gaudet, for giving us a sample of the compassion moment nominations by sharing about the individuals they recognized. Congratulating some of the PFCC Week Compassion Moment Champions at the PFCC Week Celebration. Families with medically complex children face life changing challenges that aren't just medical. We want to hear from you ... Your ideas will be used to help build a national toolkit for supporting parents of complex children and youth.